Home » Products » Fly Control Products » Fly Control For Dairy » What are Fly Predators? Fly Predators are nature’s own enemy of all common flies that breed in manure and rotting organic matter, including the common House Fly, Horn Fly, Biting Stable Fly and Lesser House Fly. In the natural environment Fly Predators serve as a major check of pest fly populations by destroying the next generation of flies in their immature pupa stage. Most locations likely have some of the species in Fly Predators already, but unless supplemented regularly, they cannot provide the nearly total fly suppression people prefer. A female Fly Predator shown on a fly pupa, ready to deposit her eggs in it. This kills the immature fly. 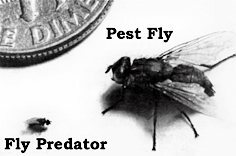 Fly Predators are tiny, completely biteless and stingless. They never become a pest themselves. After they’ve emerged, their single-minded pursuit is to reproduce by finding pest fly pupa. Because of their small size and the fact they live their entire life cycle on or near fly larva development sites, such as manure and decaying organic matter Fly Predators go virtually unnoticed. Any area where flies breed in manure or decaying organic matter can benefit from using Fly Predators. The key goal is to maintain a sufficient Fly Predator population to stop each succeeding generation of pest flies. Because flies reproduce nine times faster than Fly Predators do, adding supplemental Fly Predators every week to two weeks during warm months keeps the population balance necessary for good fly control. You must release enough Fly Predators to control all the fly reproduction in the area. You treat the farm, not the barn. For example, ordering Fly Predators for just your calves, and not the milk cows or heifers will not be sufficient as the flies that reproduce in those other animals’ manure will easily reach your barn since a pest fly can travel 1/4 mile or further. For animals rotationally grazed, release Fly Predators weekly into pastures the cows have been on for the past three days and those they will be in the next four days. With range cattle many will just treat the area nearest the home, barn and closest pens realizing that some inward migration of flies will occur, but accepting the improvement this alone offers.